The largely still unexcavated archaeological treasures of the island are not the only reason for the air of mystery which surrounds Milos. The awe-inspiring statue of Aphrodite – the goddess of love and beauty – which was discovered in 1820 by a local peasant, is marketed as the island’s main attraction, even though it was then swiftly shipped off to Paris, where the marble statue has graced the Louvre ever since as the ‘Venus de Milo’. The natural splendour of Milos, with its myriad of multi-coloured volcanic landscapes, can seem almost magical, even to its own nearly 5,000 permanent residents1. During the summer tens of thousands of visitors crowd onto the island, the numbers increasing year by year. While there is no denying that this lucrative human ‘invasion’ ensures that the islanders are able to survive very comfortably, it also inevitably creates major challenges to the island’s flora and fauna, as well as affecting its cultural heritage, infrastructure and ecological balance. Tremendous amounts of waste have to be dealt with: plastic bottles, straws and plastic bags; tyres; disposable items of all sorts; sewage overflows; depleted water resources, even overfishing – as the local fishermen are keen to sell the freshest, best quality fish and seafood to the restaurants. ? Fires, heavy mining and volcanic activity, all known for millennia on the island, have taken their toll on the soil. The list of issues is endless, and if there is one thing that unites the views of officials, volunteers and faithful devotees of the island, it is that ‘something has to be done’! But what? Where? And by whom? Opinions differ. Initiatives are taken and, as we will repeatedly hear, abandoned after a while, whether embarked upon individually or with partner organisations. 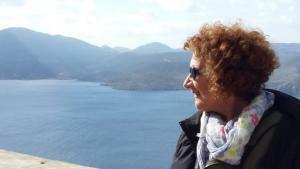 Together with Anni Mitropoulou, the dynamic Cyclades Preservation Fund (CPF) Greece Country Director, we set off to pay a three-day visit to Milos and its small immediate neighbour, Kimolos, in November this year. We wanted to hear from as many people as possible about their concerns, and see if there were any common issues where the CPF could help. We prepared for our trip, arranging meetings with architects, tourism operators and volunteers, all of whom care deeply about both the islands and are worried about their sustainable future. We learned, among other things, about plans to expand the Milos Archaeological Park to make it more accessible to tourists, hoping to create much-needed income for future development. The visit to Milos, in its glorious autumnal light and slight breeze, after a mere 40-minutes flight from Athens Eleftherios Venizelos airport, was a treat. However, our first inquiries about recycling initiatives on Milos brought a reality check. We learned that while some supermarkets take responsibility for their own recycling, the disposal of public rubbish is undertaken by a commercial enterprise located on the nearby island of Santorini. This could certainly be improved upon and become far more efficient. We learned from the Mayor’s office that fundraising efforts, no matter how enthusiastically encouraged and supported by Greek and international volunteers, have not brought about the necessary results. They complain that bureaucracy kills every initiative. We were told about plans to extract salt from seawater which would bring a welcome reduction of costs as at present water has to be brought to the island in commercial container ships. Lack of potable local water resources is one of the reasons that garbage disposals overflow with plastic water bottles, particularly during the hot summer months. Our search for local insiders to guide us through the many opportunities Milos holds for sustainably developing its natural and cultural resources leads us to the man responsible for restoration and rehabilitation of areas affected by mines at YMERIS, a French company established in Milos. We learned about the astonishing biodiversity of the island – there are 864 varieties of indigenous plants known here alone, many of them unique to Milos. They, and the vast quantity of rare birds and other animals, must be protected. It is a task to be taken seriously with research, education and study programmes. We heard many times that new ideas have come up, first steps were taken – and then the project was dropped. Nature trails already exist in Milos, but there is still a way to go. Botanical pathways specifically might bring the solution towards saving the local biodiversity a step closer. Visitors who can approach and admire rare local plants and emerging vineyards, explore archaeological sites, olive groves, catacombs, ancient ports, local production plants, ancient mines, and the many other treasures hidden on Milos will be more likely to bring responsible tourism, which, in turn, will create much-needed employment. During our short trip to Kimolos we found that here, less than a handful of committed volunteers, the ‘Kimolistas’, frequently with enthusiastic outside support, have had an astonishing impact. Partly in collaboration with the nearby island of Sifnos, they have cleaned up beaches, mapped footpaths, established a cinema and even a library. Their commitment has not waned, but it is limited to one or two persons among a community of close to 500. Will they manage to create a momentum so that more local inhabitants will participate? Owing to its central location among the Cyclades islands and its worldwide fame as the ‘island of the Aphrodite’, the time may be ripe to step forward and set an example to showcase one of the Cycladic islands’ rich natural and cultural heritages. The captivating beauty of Milos and Kimolos might eventually pull people together to show the community that respecting its past, will secure its future, and inspire them to work towards a common goal. Will it be enough? The author had a long career with the United Nations Refugee Agency and is now a volunteer of the Cyclades Preservation Fund (CPF). She is based in Greece and Austria.